Cookies & Beer: I'm Baa-aack! With a Tale of Many Trees! I'm Baa-aack! With a Tale of Many Trees! 340 fresh photos uploaded from camera? Check! Lots of catching up to do? Check! After a six-week blogging hiatus due to the unfortunate demise of our old laptop, it's hard to know where to begin now. 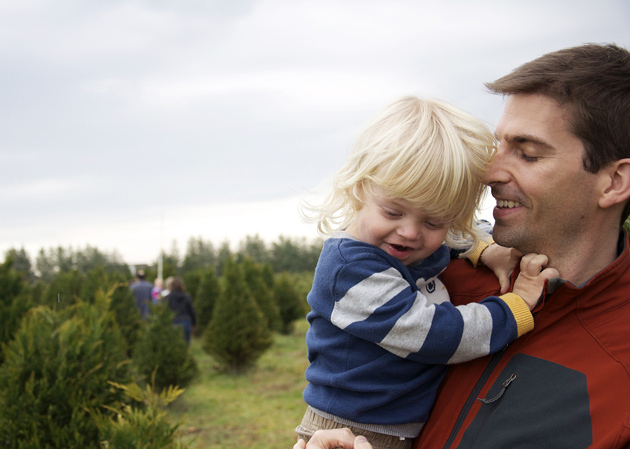 I've still got some photo editing to do, and the holidays have been keeping me busy ... so let's just start with one of our recent adventures: our trip to a Christmas tree farm! 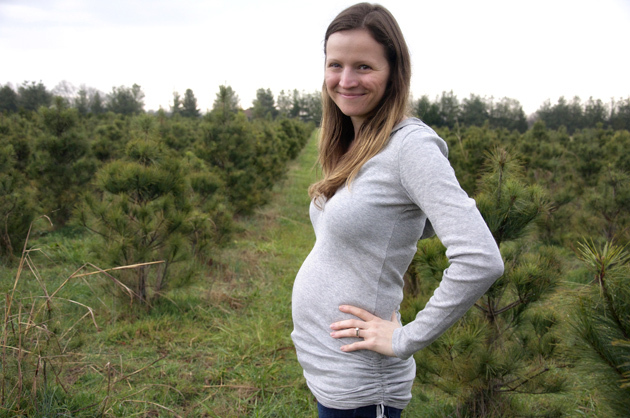 For weeks I've been talking about finding a local farm and cutting down our own tree. We started reading Max Christmas books and I tried to explain to him how we'd be selecting our very own tree and decorating it. Max is old enough to grasp these concepts this year, which has made the holidays beyond fun. I should note that the tree plan was hatched entirely by me. Ben was skeptical, with visions of Max and I sitting back and watching (or laughing?) as Ben did the hard labor of sawing down a tree and lugging it back to the car. 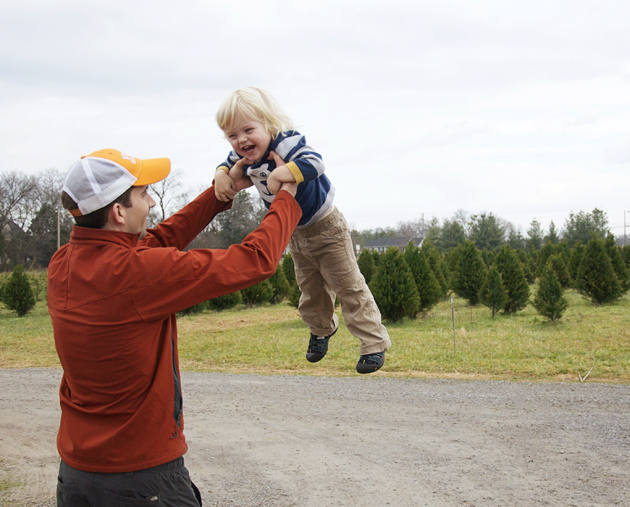 Lucky for him, the farm we went to, Country Cove, had a limited selection of small-ish trees available for cutting (they were in between crops and should have more next year), so we ended up selecting a pre-cut fir tree they had brought in from North Carolina. 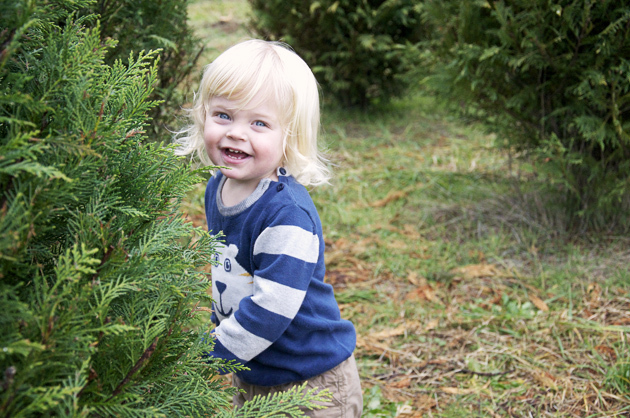 In spite of not cutting the tree ourselves, we still had a blast wandering among the lovely trees, soaking up the smell of a country bonfire, drinking hot cider, and showing Max the tractors. 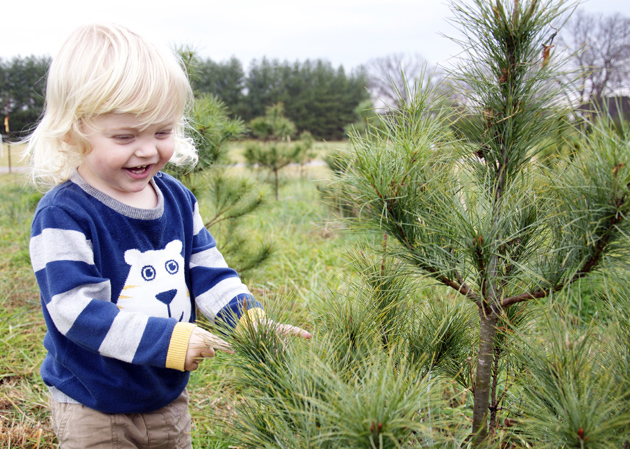 Max was obsessed with the young trees, most of which were just his height ("lil baby trees!" was his refrain of the day). Our intention was to get a tree that was eight feet tall or less, but in person those just didn't look big enough for our vaulted den (famous last words), so we boldly opted for one that measured 8 1/2 feet. Well the tree we drove home with was a monster, let me tell you. We just didn't know it until we got home and carried it inside. There were a few tense moments when we snipped off the netting and that behemoth popped open. We seriously weren't sure if we could make it work, and in a wild moment of panic I even suggested trying to sell it on Craigslist and get a smaller one. But soon enough Ben and I were laughing hysterically at ourselves. We've named this our 'Christmas Vacation' tree, after my favorite Christmas movie (you know what I'm talking about!) in which the family's tree is squished up against the ceiling and bursting through the windows. Well I love our wacky tree now, and we'll surely never forget our first real Christmas tree with Max! And who can complain when you have that fresh pine aroma filling the house? I haven't had a chance to get around to my photos of the tree in action, but I promise you'll see it before the holidays are over! In the meantime, we are feeling the holiday spirit around here, blasting Christmas music nonstop and adding little decorations here and there every day. 'Tis the season!